In a world where political discourse is too often drowning in double-speak, it’s a rare pleasure to meet an elected official who says it like it is. U.S. Congressman Dan Kildee is one of those elected officials. As the representative of Michigan’s 5th Congressional District, Kildee speaks his mind — especially when it comes to championing the best interests of his constituents and their fellow Americans. 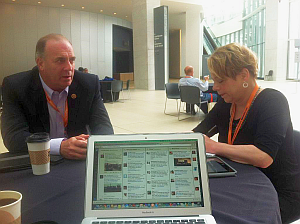 I had the chance to interview Congressman Kildee while attending the Netroots Nation conference in Detroit. During our chat over morning coffee, he shared his thoughts on the dysfunction in Congress, why it’s happening and what can be done to help legislators do the job they were elected to do: take action that helps our country and its citizens thrive. Read the full interview at Eclectablog. I’m one of the lucky people who gets to do something I love for a living. Even better? Getting to do a lot of things I love all at once — which I’ll be doing when I present an Ignite talk at the Netroots Nation conference in Detroit on July 19. I’ve always been a writer and storyteller. I’ve been a freelance writer and strategist most of my career. I wouldn’t have it any other way. But I have another love: theatre. I spent more than 20 years working in local theatre, performing in and directing one or two shows a year. I miss being onstage, and I miss the unique kind of storytelling involved in playing a role like Mrs. Lovett in Sweeney Todd or directing a play like Amadeus. 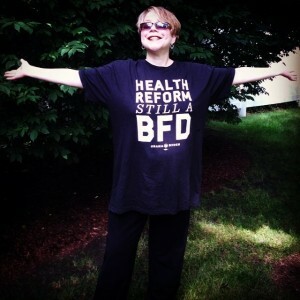 At Netroots Nation, I get to do all that again — but in a new way. The Ignite format gives presenters five minutes to speak, accompanied by 20 slides that automatically advance every 15 seconds. In this high-energy format, I’ll be talking about the Affordable Care Act and using personal stories of how it benefits Americans to demonstrate the value of healthcare reform. My passion as a writer and strategist is using communications for social good, to educate and engage people in issue advocacy and change minds. At Netroots Nation, I get to combine that with my love of theatre, transformed into a very personal kind of storytelling. If you’ll be at Netroots Nation — the country’s largest gathering of progressive leaders, activists and grassroots organizers — don’t miss the Ignite closing keynote on Saturday, July 19 starting at 4:30 p.m. ET. I’m one of 14 presenters who will be taking the stage to tell our stories. The keynote may be available via live streaming, or I’ll post a video later. Tickets to Netroots Nation are also available if you’d like to attend starting July 17. Although my Ignite talk will definitely be a high point for me, I’m looking forward to the entire conference. I’ll be doing what I love with thousands of others who feel the same way.